Godin has been dishing out remarkable instruments on the market for over thirty years. This Canadian manufacturer has earned and maintained a superb standard of quality, despite the crushingly overpowering competition. The LGXT is one of the most unique guitars on the market, combining electric and acoustic-style sounds in a solid body is a feat worthy of genuine admiration. The LGXT comes in a cutaway maple body and a flamed maple top. The neck is crafted using “Honduras” mahagony, a frequent material of choice in acoustic guitars, making this axe produce adequately warm and lush sounds. The ebony fingerboard is rigged with 22 medium nickel frets and offset dot inlays. Its neck and fretboard construction come on a scale of 25 ½, and 16 inches, respectively. The hardware on this fine axe shines due to its distinctiveness, as well as quality. The headstock rounds the instrument off flawlessly, packing six Godin front-loaded locking tuners. The gitbox features a custom RMC X-Bridge using the tremolo system. A unique addition is the onboard RMC preamp EQ meant for controlling Acoustic Volume, Treble, Midrange and Bass. The electronics, in charge of the electric sound of this guitar (duh), feature a dual humbucker setup; two Seymor Duncan pickups – a SH II Jazz at the neck and a Custom III at the bridge, complemented by a versatile five-way switch, allowing for single-coil-like sound output in the 2nd and 4th position. Lastly, you have the common Volume and Tone controls. The acoustic output of this masterpiece is enabled by turning down the electric volume and raising the volume on its transducer saddles. The guitar also packs a Godin exclusive 13-pin synthesizer with a special 3-way switch for synth controls, as well as an assignable momentary switch. This rounds off the instrument’s three diverse outputs. The tonal capabilities are only limited by your imagination here, this work of art can deliver anything. This masterpiece sounds absolutely fantastic, whether you want clean low tones… bright and crispy, or heavily distorted fuzz, it justifies its price tag by its versatility as well as striking quality. The acoustic side delivers authentic tones, especially when going through an acoustic amp, which I recommend you get one if you don’t have it already, you will be stunned by its capabilities. The possibilities keep rising when combining the electric and acoustic outputs together. I have no idea how the designers crafted this six-string wonder, I’m just glad they did. If you decide to be a proud of owner of one of these babies, you might break the bank, but it’s undoubtedly worth it, the LGXT will be an instrument that will continuously amaze you for a lifetime. For more info about the Godin LGXT Solid Body 3-Voice , click here. 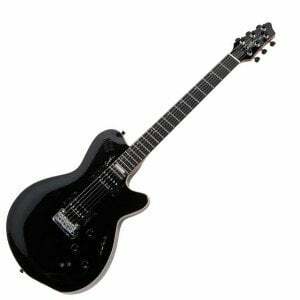 More expensive electric guitars you Might like, click here. I absolutely LOVE my LGXT! This guitar GREATLY exceeds the price point. If this was a Gibson or Fender, it would be selling for $3k+. Great job Godin!! !